As a rough guide, you can expect your baby to be gaining weight at a rate of around 170g per week. Note that your own weight gain will probably be slightly more than this. This takes the baby's weight to about 600g. The length of the baby from crown to heel is now about 30cm. By 24 weeks, the baby's facial features almost fully resemble those of a newborn baby, with eyelashes, eyebrows and hair all in place and growing quickly. However, did you know that at this stage the baby's hair is white? There is not yet any pigment in the hair so it is too early to say whether he or she will be fair, dark, or somewhere in between. 24 weeks is generally considered to be the 'age of viability', which is the stage at which the baby is thought to have a chance of survival if he or she is born prematurely. However, a baby born this prematurely is likely to have serious medical problems as many of the major organs are still very under-developed, particularly the lungs. If a baby is born and survives this early on it will be in the Intensive Care Unit for some time. By now, there is probably no mistaking all those baby movements! 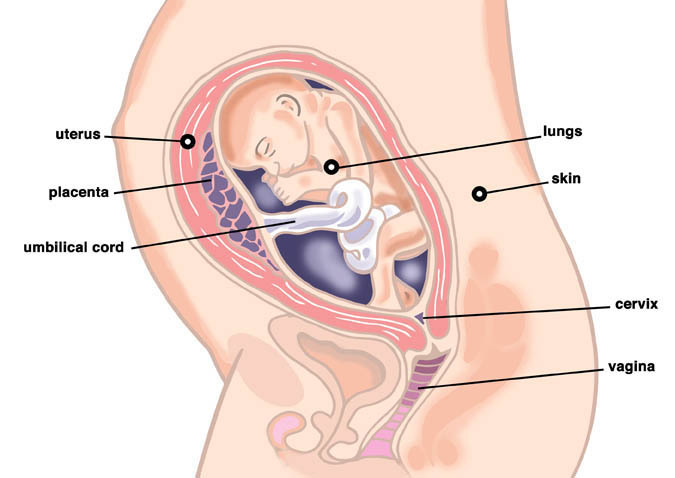 You may even find that when you sit or lie very still that you can see your tummy moving as your baby throws kicks and punches at your insides. Don't get frustrated when your partner struggles to feel these movements. Part and parcel of pregnancy is grabbing your partner to feel your tummy when it feels as though the baby is break dancing inside you, only to find that the minute they touch you it stops. They might also put their hand in the wrong place or take it away just as the movement starts again! Try lying in a comfortable position together, in bed or in front of the television and give the baby (and your partner) plenty of time for the dancing to resume. By now you have probably thought about, if not already purchased, some maternity clothes to carry you through your larger days of pregnancy. But have you thought about your shoes? It is common for women to find that they go up a shoe size during pregnancy; this is partly due to the increased fluid retention which is causing swelling, and also due to the relaxed joints and ligaments which can cause the bones in your feet to spread slightly. For the sake of comfort, make sure that your shoes are well-fitting. You should also ensure that they are practical for safety reasons. It is generally recommended that pregnant women steer clear of high heels. Flat shoes or a small heel are best, as well as shoes made from a breathable (non-synthetic) material and with a good grip on the bottom. Many women report increased back and leg aches when wearing high heeled shoes, which is likely to be down to the softer joints in your body. On top of this though, is safety. As we have discussed before, clumsiness is part of the territory with pregnancy and wearing high-heeled or slippery shoes is only going to increase your chances of taking a tumble. Page generated in 1.311 seconds.